"I was born, raised, and lived most of my life in the deep south, Georgia. I have been involved with art, drawing and painting, all my life, from the time I was 6 years old. However, as an adult, I spent 30 years working in various technical assignments with AT&T. I retired from that in 2002 so that I am now able to devote more time to my creativity. My wife and I recently relocated to Pittsfield, Massachussetts, Kathy's hometown. New to the area, I am slowly getting to know people, especially within the art community. I also give guitar lessons from my studio." "I love abstract, plus experimenting with color. The energy produced by the interaction of conceived shapes is equaled only by the power of color. Color is a magnificent force within our world. Colors can evoke feelings and ideas never thought possible. 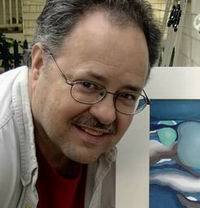 "Over the years, my work has evolved into colorful, biomorphic images, whether through oils, acrylics, pastels, or ink. Abstract expressions are exciting. Infinite possibilities! Images that beg to grow and change before your eyes. My art is not really complex or hard to understand. Just look closely and you'll see life. And life is always interesting..."
some digital pix for a show, and in 2008.